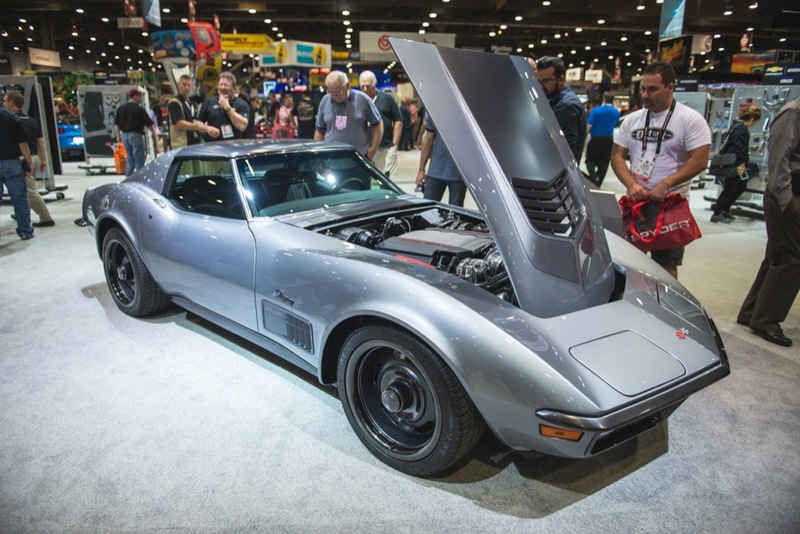 Among the special Chevrolet reveals today at the Specialty Equipment Market Association (SEMA) is this 1971 Corvette built in collaboration between NASCAR champion Jimmie Johnson and Chevrolet. Featuring exterior and interior updates, and an all-new 6.2L V8 LT1 crate engine, it’s a resto-mod par excellence. Johnson chose a subtle silver-blue exterior color plus After Midnight dark silver trim accents and Satin Dark Android graphic accents for the outside of his Corvette. Inside, the original-style bucket seats are trimmed in black leather and complemented by suede inserts. The wheel is a suede-wrapped three-spoker, while Johnson’s signature is also featured on the floor console, door panels, and seat backs. In an anachronistic twist, Johnson added carbon fiber accents throughout the interior. This classic Corvette also features a custom hood vent inspired by the current Stingray, plus restyled front fender vents and 18-inch wheels that emulate the design of the Rally wheels that Chevrolet offered starting in 1967. 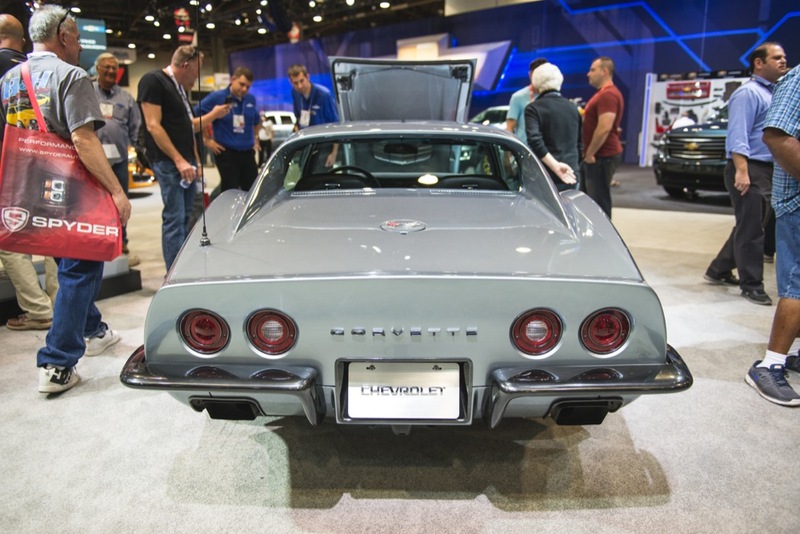 Johnson’s Corvette also features an updated chassis with adjustable coil-overs replacing the circa-1971 suspension components to give the C3 more precise handling. Brakes from a Corvette C6 Z06 have also been adapted to the car to make sure its braking matches its updated handling prowess. Under the hood resides a modern LT1 crate engine, which is offered in wet sump or dry sump versions. An LT1 was available in 1971, but this one brings modern power and technology to the table, including continuously variable valve timing (VVT) and direct injection (DI). It’s rated at 460 horsepower − about 185 more than 1971’s LT1. What’s neat about this motor is that Chevrolet offers an electronic controller and harness as well as a front-end accessory drive system to support engine integration. Admittedly, some custom fabrication by the Chevrolet build team was needed to install the new-age LT1 in this C3 Corvette but, when paired with the Super Magnum six-speed manual transmission − also offered by Chevrolet Performance − it’s the perfect match of old and new. 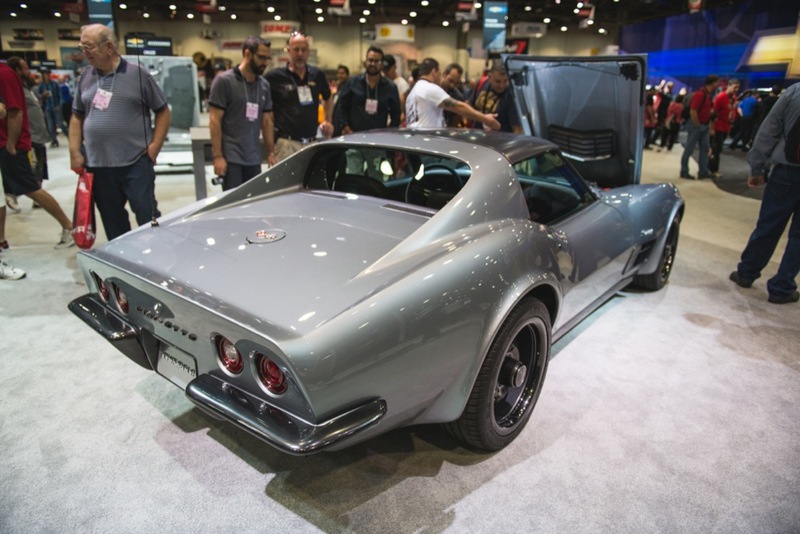 You’ll be able to see Jimmie Johnson’s 1971 Corvette in all its glory if you’re one of the privileged to have SEMA passes, which runs November 4th through the 7th. I am looking for where Jimmie/GM found the rims for his 71 corvette. I would like to put them on my restored 67 Camaro. Please reply in email to where I can find them. Any help would be great. It looks like they are regular Chevrolet rally wheels with the center caps and trim rings just painted gunmetal or black.